I have been living with a two year old Dr. Princess. She hits you, and gives you a pretend shot of medicine and a kiss to make you feel better. She doesn’t wear a stethoscope because she doesn’t have one. Instead, she wears her latest tiara. You can obtain a tiara for a dollar in a variety of craft stores. They break easily, but at least they are fun. 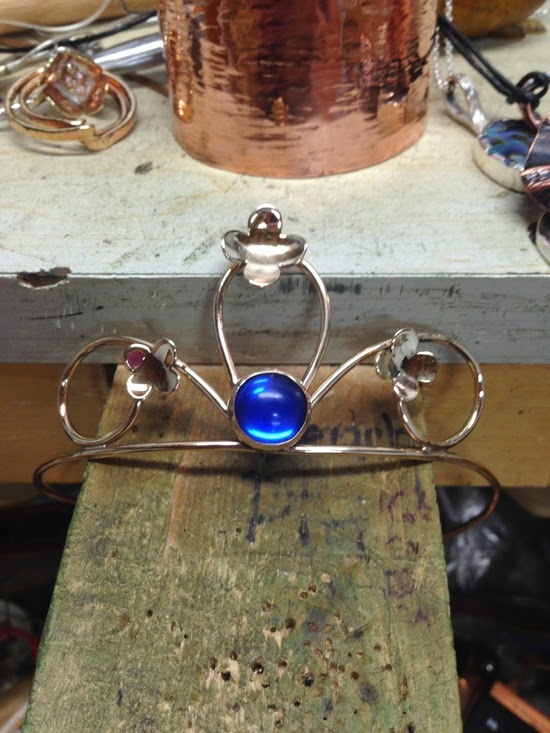 However, when Mommy is a jewelry designer/metalsmith, you really need a real tiara, right? In the meantime, I have an online friendship with a lady who I have never met in person. She lives just far enough away, it may never happen. She received wind my daughter was in need of a stethoscope and decided she wanted to give her one as a birthday present. My friend is currently undergoing cancer treatment, and she loves the idea of encouraging young girls who have expressed any interest in the medical field. Just turns out, I love the idea of encouraging middle aged women to feel like little girl princesses again. I decided matching tiaras was in order. Making jewelry for children to sell is a very complicated expensive process due to requirements for product safety testing- specifically lead. As such, Prunella’s Workshop refrains from making items for children. However, this does not preclude making items for my own, as I am aware of what materials I am using in my work none of which contain lead. I determined brass to be the most appropriate metal for the circumstance. I don’t work in gold, and this would be an exceptionally expensive tiara if I did. Sterling silver may yield a higher quality item, but brass would give me the gold color best suited to my design. Brass is also a harder metal, which will hopefully be more durable to the hard play of a child. Cheap plastic tiaras made for children often have a lot of bling. I wanted a design that would appeal to the eyes of a child, but would not be so over the top there was no possible way a grown woman would be willing to wear it. I accomplished this with the gold color, and incorporating one big stone instead of one hundred faceted stones. I chose blue glass due to the rich color against the brass, and the durability of the stone. It is harder to scratch a glass stone than many semi precious stones I had available, as it is harder. I am hoping this tiara will still be around that she may give it to a daughter of her own one day. 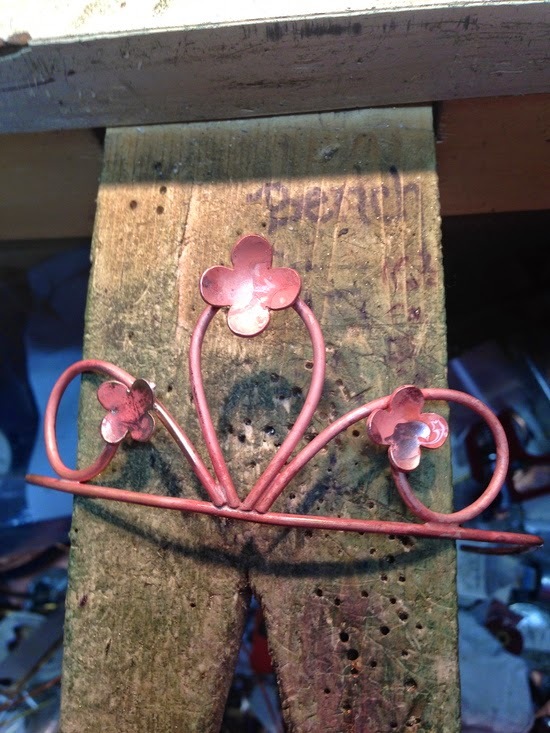 I cut and shaped small flowers for other parts of the tiara for added interest. I still needed to be certain I made the tiara over the top enough for a little girl while remembering the matching one was for a grown woman. The band for my daughter’s fits her little head perfectly, while the other band is adult sized; however, the focal point is the exact same size in every way from the flowers to the loops to the center stone. By making them the same size, instead of scaling my daughter’s down, the child focal point appears much bigger. Now here is where it became interesting. Both of my girls were aware I was making a tiara. I needed my friend to know why her tiara was special once she received it, and I have shared pictures of my daughter’s tiara with her. She has no reason to believe there are two. Meanwhile, I needed my daughter to understand her new tiara was more special than her old ones. I didn’t let her see it, but I let her know I was going to go work on it again. The excitement in her voice has been priceless. I had never made a headpiece before, but I am quite pleased with the results. I believe I will be making more in the future, as all women should feel like a princess on occasion. In the mean time, the only thing that would make this project better is if I had a picture of the princesses together!